Never Again, Buy It Now! The Los Angeles riots erupted on April 29, 1992, at the flashpoint of Florence and Normandie Avenues. 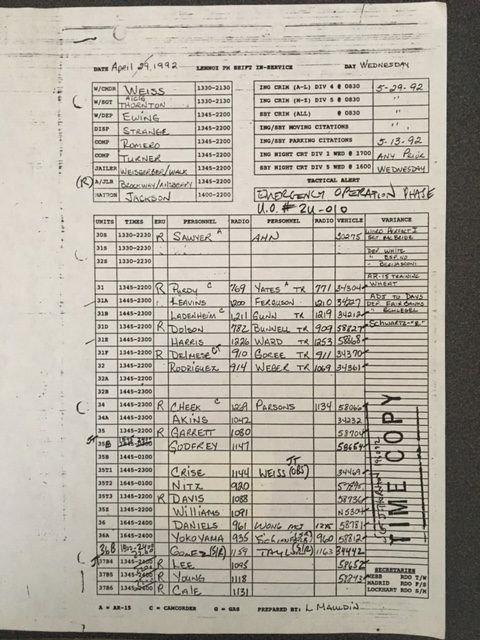 A day, a week, and a life changing event that the people on this in-service sheet from Lennox Sheriff’s Station will never forget. As the 25th anniversary of the 1992 Los Angeles riots approaches I am sharing my recent updates and press release with you. Santa Clarita, CA. – April, 2017 – In a soon to be released TV documentary and in his book, “Never Again”, author Bill C. Weiss shares his experience as the watch commander at Lennox Sheriff’s Station in South Los Angeles as the Los Angeles riots erupted at Florence and Normandie Avenues in 1992. In a recent in-studio documentary interview with KBS (Korean Broadcasting System) America, Weiss offers this true account and never-before-told insight into the hours leading up to, during, and after the Los Angeles riots. The documentary (tentatively titled “Six Days”) is scheduled for airing on April 29, 2017, the 25th anniversary in the United States (Nationwide Direct TV CH. 2082, Los Angeles Spectrum CH. 1475, Cox CH. 473, KXLA-44 CH. 44.1 and 44.8) and around the world. Check local listings for specific channel and airtime. “Never Again” is written from Weiss’s perspective as the nearby Los Angeles Police Department found itself totally unprepared to deal with this deadly and dynamic crisis. This riveting and extraordinary story reveals emergent preparations and tough decisions Weiss faced while preparing to intervene in what escalated into an unforgettable civil disturbance. He unravels behind-the-scenes events as he deals with his internal instinct to take action, waged against his self-discipline to follow orders. Weiss is put to the test up to the final moment before the opportunity to put his daring plan into action for the Los Angeles County Sheriff’s Department. As several recent incidents in Ferguson, Missouri (2014), Baltimore, Maryland (2015), and numerous incidents in 2016 have shown, law enforcement’s initial response to and handling of violent encounters and civil disturbances continues to resonate with the entire country. “Never Again”, published by Morgan James in New York, was released on November 1, 2016, and was chosen as a double awards winner in the 2016 Beverly Hills Book Awards for the Best Book in the True Crime category and the Best Book Cover Design in the Non-Fiction category. Bill C. Weiss will be attending the Los Angeles Times Festival of Books event on the University of Southern California campus on April 22-23, 2017, at booth #167, under the Writers Mastermind Alliance banner. “Never Again” is available at various retailers, including Barnes and Noble, Amazon, BAM, Powell’s, Indie Bound, and Chapters Indigo. The book is available on Amazon.com, https://www.amazon.com/Bill-C.-Weiss/e/B01FY5BFUY. For additional information on the book (ISBN 978-1-63047-904-6) visit http://www.billcweiss.com. To secure an interview or speaking engagement, please contact Bill at bill@billcweiss.com. I will be attending the Los Angeles Times Festival of Books, as an exhibitor with several other fellow authors in booth #167, which will be held on the University of Southern California campus on April 22 & 23, 2017. The hours for Saturday (4/22) are 10AM – 6PM and Sunday (4/23) 10AM – 5PM. Please come by and say hello and check out my book “Never Again”, a never before told insight into the 1992 Los Angeles riots, and the books of several outstanding authors. The month of April is also the 25th anniversary of the 1992 Los Angeles riots. Booth #167 will be in the center of the USC campus on Trousdale Pkwy, not too far from and east of Tommy Trojan. The banner title for the booth will read Writers Mastermind Alliance. Massacre in Las Vegas: Is It Time For All Cops to Carry? “Never Again”- A Double Book Awards Winner! Should Attacks on Police be Considered a Hate Crime?